We hope you enjoy this month's newsletter -- My "Almost" Running Injury and also an update to last month's topic -- Running in the Alpha State of Mind. 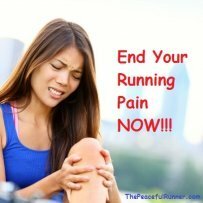 If you find this information helpful, please be kind and share it with your running friends! A few weeks ago, I was interviewed on the Conscious Runner Podcast. My interview was entitled, "Making Running as Easy as Possible and Never Getting Injured." We discussed various ways to prevent running injuries including how important it is to believe that you will not get a running injury. I am glad I have a strong belief that I will not get injured while running because it was thoroughly tested recently. On Saturday of last week, I felt an ache in my left hamstring. I reminded myself not to panic and to relax with the sensation and feel it fully. I sent love to the area and asked it to relax as I continued to run. It was a stubborn ache so I had to continue this process for quite some time. Eventually the ache was gone and I happily ran home without a running injury. But that is not the end of my story. Then on my regular Monday morning run, the ache in my hamstring came back again! I couldn't believe it. This never happens to me. Could this mean that I am really going to develop a running injury? No, I didn't believe it. I began to repeat the same ritual as I did on Saturday, but the ache didn't seem to want to go away. What do I do now? Then it occurred to me—maybe my body is not as relaxed as it could be. So I tried to completely relax my body. I kept running but imagined that my body was so relaxed, it was just hanging on my bones. I maintained my form but I visualized that all my muscles and flesh were just dripping off my body as if they were melting. It doesn't create a very pretty sight I know, but it was very effective in relaxing my body. There was no tension anywhere in my body as I let everything go with gravity. I didn't have to do this for very long before the ache in my hamstring was gone and I haven't had any problems with it since. 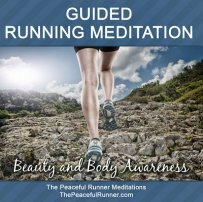 There is a lot to be said for keeping our bodies relaxed while running. It is a good idea to practice relaxing your body at home first so you can be ready to try it should you feel a stubborn ache while running. and will take the time to put that belief into motion." To practice this at home, start in a standing position with your arms at a 90 degree angle as you would while running. Take a few deep breaths and then imagine gravity taking over. Let all your muscles and skin go limp but keep a good standing posture. Let everything go except your form. Then walk around a little while swinging arms back and forth and continue to maintain a totally relaxed body. It is a great way to quickly let go of any tension in your body. When you get how this feels, you can easily do it while running. So the point of this story is to believe and really believe that you will not injured while running. 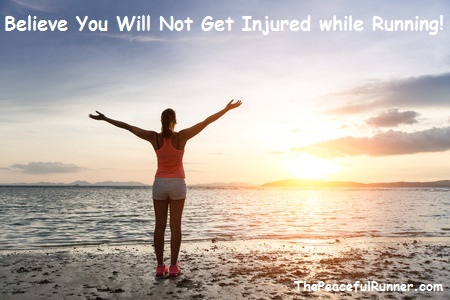 There is always something we can do to keep a running injury away. We don't have to be victims to every ache and sensation that arise in our bodies. We can be in control. We just need to start believing this so it can become our reality. On the podcast I share some tips on how to change our beliefs so that we can start believing that we will not get a running injury. How about you? 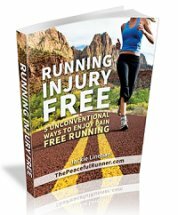 What are your beliefs about running injuries? We would love to hear from you. Please share your comments below. I have been practicing the technique required to run in the Alpha State of Mind, which is a state that simulates what we experience during runner's high. The body and mind are perfectly coordinated and comfort can be experienced even during vigorous exercise. Slow, deep nasal breathing and a quiet mind is required in order to experience this state. I am learning that having a quiet mind is just as important as the breathing techniques as it is an experience that comes from within. This happens automatically when we run in the "zone," but to achieve it regularly means recreating what happened naturally using our minds and our breath. I had a few good experiences using this technique during the past few weeks. I counted 14 breaths per minute (bpm) on one run while I was doing a fairly quick pace. On two other occasions I counted 20 bpm, which means I am making progress but I am not there yet. I don't like to count my bpm very often because it is distracting to the quiet mind I am trying to achieve. So I have started trying to gauge it by feel. Overall learning this technique is very slow going, but I would like to be able to run in the Alpha state of mind more regularly so I will persist. Hopefully, next month I will have more progress to report. A physical indication that has been noticed while someone is experiencing runner's high is a pause in or a slowing down of the breath, such as a gap between the exhale and the inhale where the runner appears not to be breathing for short periods of time. If we place our awareness on our breath and try to create this gap, it may help put us in the zone more easily and more often.